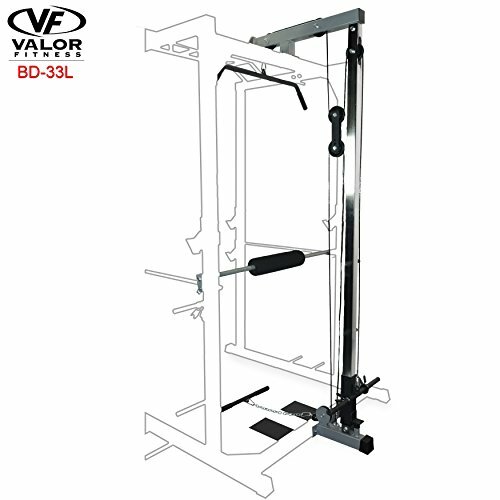 The Valor Fitness BD-33L Lat Pull Attachment, constructed of 12-gauge steel 2” x 2” frame, transforms the BD-33 Power Rack into a complete home gym. Adding the Lat Pull Attachment increases the variety of exercises to include Lat Pulls, Triceps, Upright Rows and Curls just to name a few. Foot plates provide additional comfort when performing seated row exercises. Includes 38" lat bar, 20" accessory pull down bar, and a padded lap bar to keep your body secure during the lat bar exercise. Max weight load is 250lbs. Warranty: 3 Year frame, 2 Year cable, 1 Year pulley.